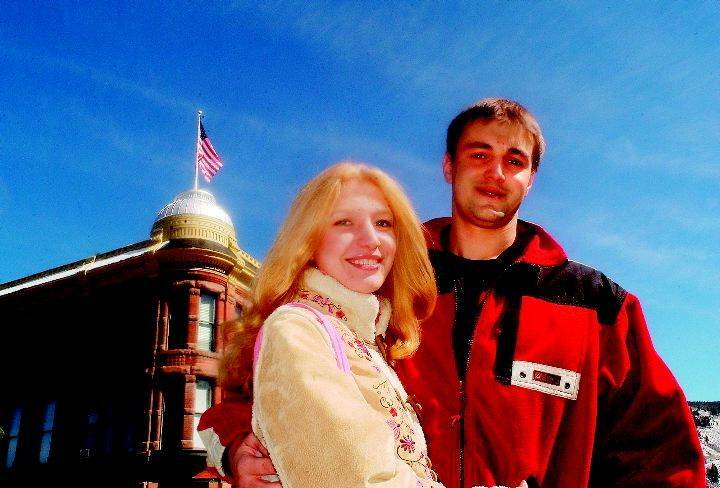 Iryna Zykava and Sergei Petrovich are two of about 15 Belarus citizens living and working in Aspen this winter. Aspen Times photo/Mark Fox. Iryna Zykava has stopped trying to tell people she meets in Aspen that she’s from Belarus. She usually just gets a blank stare or, at best, a vague nod.”That’s OK – people don’t know where Belarus is,” she said. “Now I tell them, ‘Hi, guys, I’m from Russia. '”Zykava is part of a close-knit group of about 15 people living in Aspen who hail from Belarus, Russia or the Ukraine. Some are passing through for the winter. Others, like Zykava, have been in Aspen for a while and plan to stay for an undetermined time.Zykava left her native land in June 2003 with the hope that America was still the land of opportunity. She hasn’t been disappointed. She’s amazed at all the small businesses in the United States and the ability of common folk to open their own establishment. In Belarus, she said, the government still runs about 80 percent of the economy. The country was part of the Soviet Union before that empire disintegrated. It’s been independent since the early 1990s, but remains closely aligned with Russia.A typical worker in Belarus makes about $200 per month, according to Zykava. A college-educated professional can make $500 per month. She easily surpasses that in a week in Aspen.Belarus has a population of about 10 million. Much of the country is rural and forested. Many people live on small farms and make a living raising livestock and growing vegetables.The landlocked country is sandwiched between Poland on the west, Russia to the east and northeast, Ukraine to the south and Lithuania and Latvia to the north.There are lots of little towns hundreds of years old, although roughly 60 percent of all towns and cities were destroyed and 25 percent of the men killed during World War II, Zykava said. Belarus, also known as White Russia, was occupied by the Nazis and was in the heart of the brutal Eastern Front during the war.Zykava grew up in Minsk, the capital city, where her mom teaches piano and dance. Iryna was preparing for her fourth year at a university in Minsk when she decided to travel. She used the Internet to research the United States and found that jobs were plentiful. That gave the then-20-year-old the confidence she needed to make her first trip overseas.She flew alone to New York City but left after one day. “That was enough to know that wasn’t where I wanted to stay,” she said. Through further research she learned that Aspen was a small town – “not so scary.” There were also lots of jobs. Those were the two criteria she was seeking.Zykava doesn’t fit the mold of the typical young adult who gravitates to Aspen from a foreign land. She wasn’t attracted to the mountains for skiing and snowboarding. She’s not just killing time between years at the university.Zykava said she wants to return to school in the United States and finish her education in business management. Until then she wants to gain as much practical experience as possible at stores in Aspen.The slender blonde with a pleasant demeanor, a constant smile and a solid command of English had no trouble landing jobs in Aspen. She now works at least 60 hours per week at Short Sport and Bath & Body Works.Zykava, 22, still doesn’t ski or snowboard. She doesn’t want to risk injury, she explained. Otherwise, the mountain lifestyle suits her well.She has already stayed longer than she intended. “I realized I have more opportunities here,” she said.She’s paying close attention to her employers’ business practices, getting a feel for what it takes to run a business. She misses her family and friends, of course, and she’s had to adjust her tastes somewhat to food in the United States. She’s used to eating a lot of fresh veggies. “You fry them, for some reason,” she said.Potatoes, she said, are also a staple in Belarus. And we’re not talking french fries. She said she cooks at least 14 potato dishes including “druneeky,” pan-fried potato pancakes made with eggs, salt and sour cream.Zykava really hasn’t experienced much culture shock. American products are widely available in Belarus. “Here everything is made in China,” she noted.One surprise for her in Aspen was the lack of dance clubs. Although Aspen has a lofty reputation for its nightlife – deserved or not – Zykava isn’t all that impressed. She said it’s nothing like she was used to in Minsk.When she first arrived, she couldn’t even hit the bars and dance clubs because she was only 20. People in Belarus can drink at an earlier age and it’s not a big deal. “So, you’re a little uptight,” she said.On the other hand, she’s been impressed by the general friendliness she’s encountered from Americans. “Russian people don’t try to be kind to each other. I don’t know why,” she said.Some habits of her American contemporaries also surprised her. Zykava said she grew up in a culture where it’s common to use a lot of makeup.